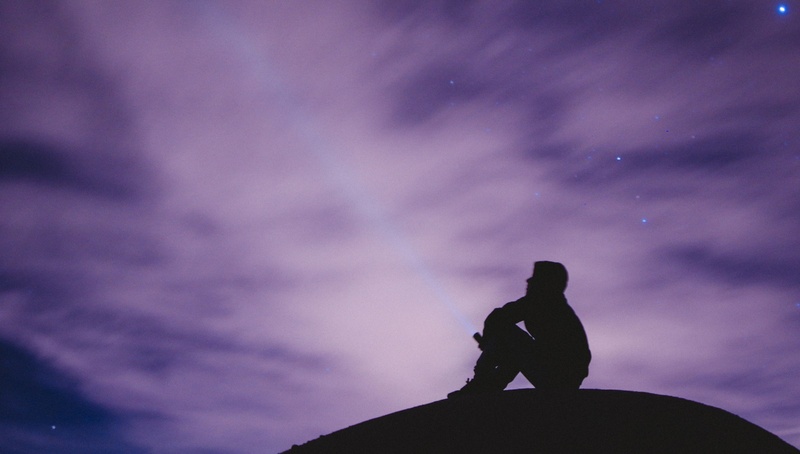 Seeing a shooting star and making a wish may seem to you like pure chance. However, the truth is you can help chance come your way by being in the right place at the right time. Every year, around 12 August, the night sky fills with hundreds of shooting stars (or meteorites, to be exact). That’s thanks to the Perseids, a spectacular annual meteor shower. 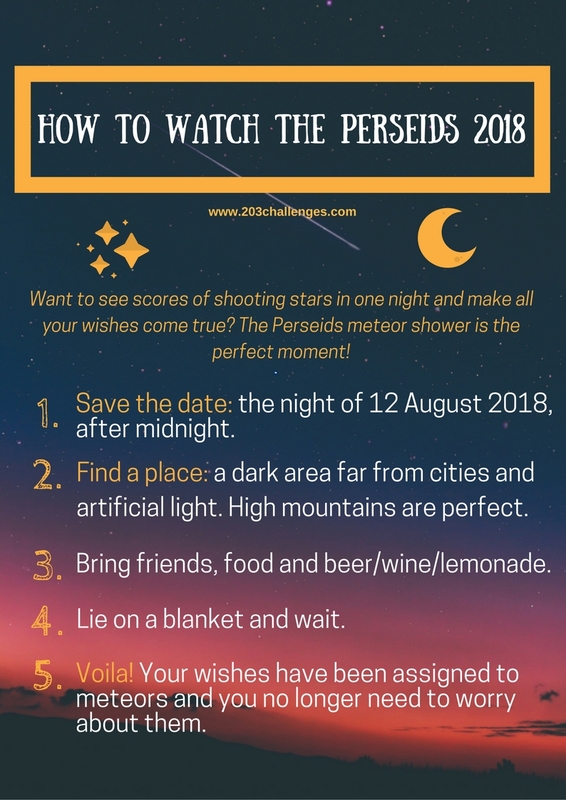 The Perseids can be observed from late July until late August, peaking around 12 August (The 2018 Perseids will peak on the night of August 12 and early morning hours of August 13. This year, the thin crescent moon will set early in the evening leaving dark skies for what should be an excellent show. Best viewing will be from a dark location after midnight.). During the peak of the shower, hundreds of meteorites can be seen every hour. To make the most of the experience, you need to go to a place with minimal artificial light (as far as possible from cities and villages). It’s the perfect opportunity to combine the meteor shower with a night picnic – just pack a meal, find a nice patch of grass and enjoy! You can see the Perseids meteor shower best in the northern hemisphere and down at the mid-southern latitudes. The meteors are called Perseids because when we look at the sky it appears they come from the constellation Perseus. In Western European countries, they are known as ‘the tears of Saint Lawrence’, due to the fact that the Perseids peak on the night of the Catholic holiday celebrating St. Lawrence. In fact, the shooting stars we see in the sky are part of the comet Swift-Tuttle. Organize a night picnic in a dark area, far from the city. Bring some food, beer, and blankets and indulge in sweet chats with friends in between the shooting stars. You can make a list of your wishes and tick them off once they have been assigned to a certain meteor. There are other meteor streams throughout the year: Geminids in mid-December, Lyrids in mid-April, Quadrantids in late December/early January. Mark them in your calendar to keep your wish-making options open all year. Or alternatively, you could visit some of the places around the world that promise making wishes come true! This is amazing! I totally want to see shooting stars, where is it that you can see them from on August 12 this year? I’m in Canada! I have waited up for the Perseieds before – in Dorset, England – and it was really worthwhile, I think it was a particularly good year for them! Omg this looks amazing! I love the idea of a picnic while watching! I am going to try to witness this one day! Wow – I’ve never heard of this before. Might be a silly question – can you see them in the Southern Hemisphere as well? This sounds so much fun. I will watch it with my boyfriend. Sounds like a nice date and we will be in Scotland then on holiday. Can’t wait! Thanks for the tip! I love looking for meteor showers. I’ve seen some of the Perseids in the past, but only from my home in a pretty populated area where the skies are dark. I’d love to try to see them this summer since the shower peaks on the weekend, but it’s a bummer about the moon. Oh, this seems so amazing! I wish even I could watch them! Oh, that is so great. Thanks for sharing this, I will probably now plan my travel plans around that date, so I can hopefully see them. I tried to see shooting stars each year and rarely see them. Maybe this year I’ll see them… We have a Pride festival on August 12 and it would be the cherry on the pie to see the Perseid right after! I wish I could see this. Unfortunately I live in the Southern Hemisphere. I should work on getting to the Northern Hemisphere in time for the next set of tears of Saint Lawrence! Ooh it’s tonight for me and I’m not going to be able to do it because I’m out with friends (indoors!)! What an amazing idea though. I’ll try and sneak out! Wow! This looks so magical! It’s amazing what nature is capable of. It’ll be amazing for my kids to see – going to check and see if it’s visible from our location this year. Thanks for the top off. I’m so pleased I stumbled across your blog! I’ve made a note in my diary and will be looking skyward around the 12th. It’s too bad I will be in Vegas on the 12th haha! Also – don’t forget about the eclipse on the 21st — that’s a big deal this year!